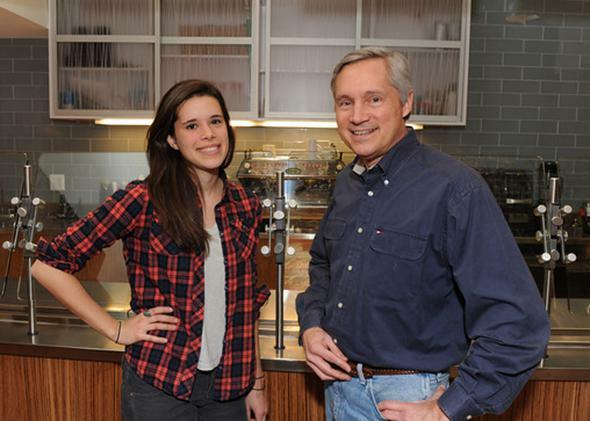 Going into business with my father: My dad and I started a yogurt shop, and it didn’t end well for either of us. A few years after I graduated from college, my dad and I decided to go into business together. I had hated my work as a paralegal and wasn’t sure what to do next. My dad had worked in the same job for nearly 30 years and had always wanted to start a business. In 2010 we opened Yola, a coffeehouse and fresh (not frozen!) locally sourced yogurt shop, in Washington, D.C. There are many reasons not to go into business with a family member, as plenty of well-meaning people told us. But my relationship with my dad had never been emotionally fraught, so all the talk about how family conflict could derail a business didn’t seem to apply to us. We were loving toward each other, and slightly aloof. When I was growing up, my dad did a lot of the housework, regularly drove me to school, and specifically chose a career that enabled him to be around a lot. He was always very present in my life, but I never poured my heart out to him. Feelings are not his strong suit. My dad gives awkward hugs, and signs his emails “luv” instead of “love.” When, on the rare occasion, he did something that hurt my feelings, I would tell my mom rather than confront him directly. Since I’m a lot like my dad—I too feel awkward with displays of emotion—this arrangement worked for us. Yola was doomed from the start. We had rented too large of a space for too much money and had blown the little money we had on the build-out. Once open, we were plagued by something that I have now gathered is fairly common with independent restaurants: The shop was bustling, we served hundreds of customers every day, creating a backbreaking workload, but we were bleeding cash the whole time. Running the shop often brought out the worst in us. The decency that we had previously supposed was in our natures turned out to be just circumstantial. We were crabby all the time, especially to each other, because we were the only people we could take out our frustrations on without risk of lawsuit. If an employee quit suddenly, did his job too slowly, added yet another thing to my to-do list, or made trivial complaints, I summoned my reserves of patience and tried to deal with the issue calmly. If my dad wanted or needed something, I went straight into sulky teenager mode. Leave me alone! Metaphorical door, slammed. Every day our scones arrived from our baker in an uncut sheet, and someone had to cut them behind the counter. One day I took on the task with no awareness of geometry or any sort of plan, and about halfway through the work, I realized my mistake. The scones were all different shapes and sizes. In my mind I could hear a customer whining in a nasally voice, “My scone is smaller than the other scones!” As I cut the remaining scones, my rage rising, I felt a presence behind me. It was my dad. “You’re cutting those scones wrong,” he said casually. I may or may not have told my father, the man who on more than one occasion dug through restaurant dumpsters when I accidentally threw out my retainer, that I was going to kill him on more than one occasion while the shop was open. And, in the throes of despair, sleep deprivation, money anxiety, and the general helpless rage that comes from running a failing small business, my dad may or may not have lost it on me a few times too. We didn’t mean the horrible things we said to each other, it just felt really good to say them. To write that I did not know my dad before working with him would be inaccurate. I knew plenty about him, but it was all in relation to me. His primary identity was Dad, Father of Laura. Working with him gave me the opportunity to see him through the eyes of suppliers, employees, bank tellers, loan officers, contractors, and architects. He was kind to everyone. Strangers would come into the store and tell me what a decent guy he was. People invested in the store because they trusted him. But working with your parent is like working with a shadow version of yourself. My dad is a nice guy, and raised me to be the same, and we were both nice—too nice—as business owners, the kind of nice that could also be called spinelessness and a desire to be liked. We were conflict avoiders. Under stress, our natural instinct was to run and hide. We almost never fired anyone and both felt awkward about telling people what to do. In my dad’s defense, running the front end of the store was my job; he handled our accounts and financing. But I could see the sparkle of fear in his eye when he was near the counter and noticed something wrong. “Bob didn’t wash his hands after he handled the money, will you tell him?” he would say to me. I wanted to bark back, “You tell him!” But not because I was some master delegator, but because it felt patronizing to tell an adult to wash his hands. I didn’t want to do it either. As Yola sunk further into debt, I stopped picking up the phone and tried to avoid my dad when I could. My stomach used to sink when my cellphone rang because it meant one of two things: 1) It was an employee or supplier calling to say something was wrong, or 2) it was my dad calling to say something was wrong. The rules of our relationship changed. Previously, lurking in the back of my mind was always the comforting feeling that I had support systems, that if everything fell apart, I could turn to my parents and they would know what to do. But one day, as we were looking at the contract from our equipment financing company, I realized we were both truly screwed. The interest rates on the loan were indecipherable and seemed to change every month, and my dad’s face was pale as we tried to understand the numbers and language on the paper. I realized then that I had been hoping all along that my dad would whip out some secret old-person business savvy that would somehow get us out of this. I thought of myself as independent and self-reliant, but all along, I had just wanted my dad to fix this. “We’re fucked,” he said. In the end, we weren’t. We both lost money, my dad went gray, but we found a buyer for the equipment and the lease, and nobody died. Two years after this journey began, on the last day the shop was open, friends and family came by Yola to commiserate. I rang up the last customer, and my dad and I counted the drawer. A Champagne bottle was uncorked, and we drank. When we put the key in the door to close up, my mom and my now-husband were there. We all hugged. My dad and I did our usual kind-of-awkward embrace, but I knew he was the only person who could understand what I was feeling. About a year after the store closed, my dad and I were talking on the phone. The shop came up. I asked him if he regretted opening it. “Yes” was his answer, an emphatic “yes” followed by a laugh that sounded like despair. I had been feeling guilty, realizing that, of all the people who were involved with the shop, I had gained the most from it. I learned more in two years than I probably had in the previous 10. My nerves were frayed, but I was grateful for the experience. I wanted my dad to tell me that he had gotten something out of it too—perhaps that he had learned some business lesson that he could apply to his work now? Had he at least gained some important life insight, like not to sweat the small stuff or one of those other things people say? Apparently not.